You can become a more successful at parenting, the most important job of your life, with Active Parenting Now. This workshop is designed for parents with children ages 5-12. Complete challenge courses with your favorite super heroes of all time! The foundation of a child’s success is rooted in early childhood. 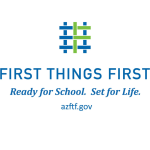 Since 2007, Arizonans have entrusted First Things First with resources to expand or enhance early childhood programs that help Arizona children birth to age 5 get ready for school and set for life! In Arizona, suicide is the second leading cause of death of ages 15-34. This is especially true for Native youth in Arizona. Walk of Hope is an event that represents one’s life journey – a series of small steps filled with hope – and is a reminder that no one should walk this journey alone. A recent study has proven that Quality First works to improve the quality of early learning settings and that the scale used to rate programs does reflect distinct levels of quality.